Allegra is one of the rotating instructors at the Freight & Salvage's Old Time Harmony Singing workshop, and she has taught at Centrum's Voice Works in Port Townsend, WA, and at Blackpot Camp in Eunice, LA. 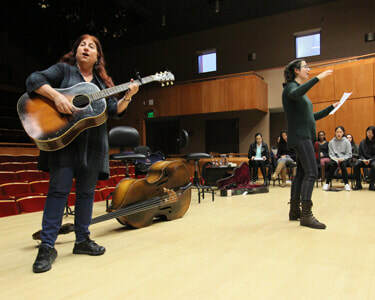 She also teaches private lessons in singing and easy acoustic accompaniment techniques in the San Francisco Bay Area. For information about scheduling a lesson or workshop, email allegracita@gmail.com.